The Parish Council meets on the third Tuesday of each month, 7.30pm, at the Royal British Legion Hall in Wrafton. Members of the public are welcome to attend. To view the Parish accounts for 2017/18 click on 'HPPC Draft Accounts 2017-18' in the menu on the left. We now have a stock of (empty) sandbags available for Heanton residents who have a risk of flooding, eg in Williams Close/Manor Close. Contact Steve Crowther on 01271 813844. The Parish Council have now set up road grit stores at Eastacombe House, Heanton and Station House, Wrafton as well as obtaining a new grit bin on Heanton Hill and a mobile gritting machine for Wrafton and Chivenor. 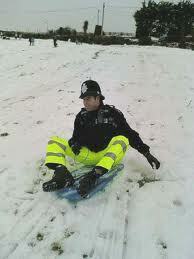 If you have ice and snow problems, call John Monks on 01271 817627 and the Snow Patrol will come and sort you out. Be part of the Heanton Snow Patrol! Okay, you don't get a policeman's helmet or yellow trousers, but you do get the satisfaction of keeping your street safe and clear when the snow and ice arrive. Heanton's now part of the county's 'Snow Warden Scheme', so we've got 3 tonnes of grit/salt, a gritting machine and a burgeoning network of authorised Snow Wardens who will try and make sure the roads and pavements are passable. However, we still need volunteers to cover Hart Manor, Barn Park, Poyers, Orchard Close, Williams/Manor Close, Westlands/Glebelands/Southlands Close, Rectory/Dunns Close, Capern Close and Chivenor. If you'd like to join, please contact the Parish Snow Warden, John Monk on 01271 817627.